"The Most Bountiful Food in Human History?" It has been my gut-level (sorry, pun) feeling for a while now that the McDonald’s McDouble, at 390 Calories, 23g (half a daily serving) of protein, 7% of daily fiber, 20% of daily calcium and iron, etc., is the cheapest, most nutritious, and bountiful food that has ever existed in human history. Who would like to argue against him? And if you attack on the “nutritious” dimension (I suspect you will), be very specific. 100% Pure USDA Inspected Beef; No Fillers, No Extenders. Prepared with Grill Seasoning (Salt, Black Pepper). Enriched Flour (Bleached Wheat Flour, Malted Barley Flour, Niacin, Reduced Iron, Thiamin Mononitrate, Riboflavin, Folic Acid), Water, High Fructose Corn Syrup and/or Sugar, Yeast, Soybean Oil and/or Canola Oil, Contains 2% or Less: Salt, Wheat Gluten, Calcium Sulfate, Calcium Carbonate, Ammonium Sulfate, Ammonium Chloride, Dough Conditioners (May Contain One or More of: Sodium Stearoyl Lactylate, DATEM, Ascorbic Acid, Azodicarbonamide, Mono and Diglycerides, Ethoxylated Monoglycerides, Monocalcium Phosphate, Enzymes, Guar Gum, Calcium Peroxide), Sorbic Acid, Calcium Propionate and/or Sodium Propionate (Preservatives), Soy Lecithin. Milk, Cream, Water, Cheese Culture, Sodium Citrate, Contains 2% or Less of: Salt, Citric Acid, Sodium Phosphate, Sorbic Acid (Preservative), Lactic Acid, Acetic Acid, Enzymes, Sodium Pyrophosphate, Natural Flavor (Dairy Source), Color Added, Soy Lecithin (Added for Slice Separation). Tomato Concentrate from Red Ripe Tomatoes, Distilled Vinegar, High Fructose Corn Syrup, Corn Syrup, Water, Salt, Natural Flavors (Vegetable Source). Cucumbers, Water, Distilled Vinegar, Salt, Calcium Chloride, Alum, Potassium Sorbate (Preservative), Natural Flavors (Plant Source), Polysorbate 80, Extractives of Turmeric (Color). Distilled Vinegar, Water, Mustard Seed, Salt, Turmeric, Paprika, Spice Extractive. Finally! People always looked at me weird when I ordered three of these and left the fries to the fatties! $1 for a 1 lb bag of lentils at wal-mart (about 4-5 meals comparatively). Much cheaper and not even competition for more nutritious. More bountiful? Not as available in the sense of preparation and there are probably more McD's than grocery stores. Yes you have to cook yourself but that wasn't a bar for competition. I think the "bountiful" criterion is where McDouble has its only arguable advantage over lentils. 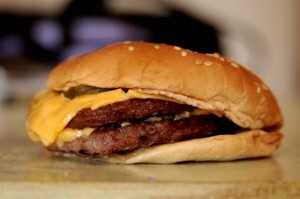 That said, the McDouble is underrated, even if not the best. @Sean: You'd lose weight in 30 days because lentils are not a complete source of protein. Your hair would likely be falling out and your brain function would be on the decline. Also, lentils are bland and boring. All The Amino Acids are there. I don't see how you can claim an uncooked bag of lentils as a comparison to a sandwich that is ready to eat. You'd need to figure in the cost of cooking and seasoning them so they are reasonably palatable to an average person. Really? The 'cost' of cooking & seasoning them? Boiling water: cost is negligible. salt or hot sauce per serving: same. According to a Japanese poll in the year 2000, "the Japanese believe that their best invention of the twentieth century was instant noodles." As of 2010, approximately 95 billion servings of instant noodles are eaten worldwide every year. China consumes 42 billion packages of instant noodles per year – 44% of world consumption – Indonesia, 14 billion; Japan, 5.3 billion, Vietnam 4.8 billion, USA 4 billion. Per capita, South Koreans consume the greatest amount of instant noodles, 69 per capita per year." Momofuku Ando got his obituary and a big story in the NYTimes when he died January 5, 2007, having arguably done more to alleviate world hunger than any human in modern history. They sure kept me alive at $0.10 each when I graduated from college and couldn't get a job. The entire bun is devoid of nutrition. The beef is GMO grain-fed with a poor Omega 3:Omega 6 ratio and probably pumped full of antibiotics. Too much HFCS throughout. Too much salt. Too many weird things I've never heard of and would probably not want to eat. Too many mentions of "natural flavors", which is used to cover for ingredients (like MSG) everyone knows are unhealthy. You can add Big Mac sauce to these for $.10-$.25 depending on which McDonalds you go to. « Previous PostDoes Anybody Still Invest in Japan?